One of the best recipes for summer or anytime is Chicken and Ribs. Not just any ribs but full on BEEF ribs that are meaty and bold with full flavors that don't overpower the meat. And how about juicy full flavored chicken? Well in this recipe we will show you how we make juicy chicken and savory beef ribs right on our very own Weber grill. We've taken pictures and put them into two stages: Step 1 is the being grilled on the charcoal grill for about 1 hour. In this step we took a whole chicken and split the chicken in half. Since our Weber is about 18 Inches in diameter and the fact that we are going to be cooking with indirect heat we didn't have a lot of room to spread both the ribs and chicken out over. You will need some plastic bags or containers to hold the ribs and chicken within separately. First after splitting the chicken coat both with Standard Yellow Mustard. The mustard will marinate the chicken actually pre-marinating it for the later addition of the dry rub. Once each is coated and placed in their respective containers, place the containers in the fridge. I like holding in the fridge overnight. But if you only have a few hours then hold the chicken and ribs for at least 1 hour in the fridge. Afterward you will want to season the chicken and ribs with our very own dry rub seasonings Jake's Famous Tri Tip Rub mixing in 2 Tablespoons of Jake's Famous Pure Santa Maria Dry Rub. Coat the chicken thoroughly inside and out. Then place the chicken in its container and place back in the fridge for another hour. This will allow the seasons to effectively marinate the chicken. On the Beef ribs you have a choice, straight dry rub or you can add a little Asian flavor to the ribs. If you just want straight dry rub then follow the same steps as the Chicken. Coat the beef ribs and place in the fridge. Picture one below shows the first stage of barbecue. As you know the difference between barbecue and grilling is straightforward. If you use high heat and cook quickly you are grilling. If the heat is moderated and you cook over time you are barbecuing. After marinating in the fridge leave enough time to have the Chicken and Beef Ribs rest on the kitchen counter for at least 30 minutes. We want to barbecue when the meat is close to room temperature. Making barbecue with room temperature meat means the meat will cook more evenly and doesn't need to first warm up before the cooking process begins. For Step 2 let's say you want to try a really nice Asian Marinade then follow these steps. Blend the mix together and coat the rib then place the container in the fridge for at least an hour. Step two below shows how we've barbecued the chicken and ribs at about 275 degrees for about 2 hours. 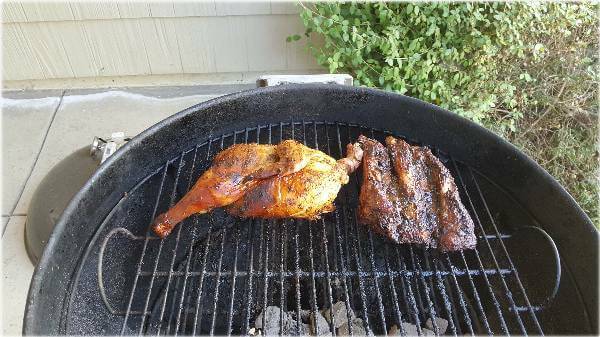 We barbecued for 1 hour with the meaty side of the chicken toward the heated briquettes then flipped the chicken and ribs over and continued to barbecue with the meaty side closest to the heat source. Since we are barbecuing on indirect heat we prepared our charcoal just until the coals began to ash white then we spread the coals to one side away from the meat to be cooked. Place the Chicken and Beef Ribs on the grill. Put the lid on and add a temperature thermometer to track the heat level. On our Weber we cranked down the vents on the top and bottom of the grill to about 1/4 to 1/2 of the opening space to get the right level of heat. Indirect heating allows the heat and or wood smoke to roll over the meat creating a nice layer of heat just before the heat rises out of the top of the grill. Keep in mind cranking down the vents does not drive the temperature down instantaneously, you will need to check the grill every 5 minutes at least 3 times before the temperature settles down into the range you want. Once you've cooked for about an hour and a half it's time to think seriously about testing the temperature of meats. Take a meat thermometer and test the chicken in the breast area and in the thigh area. The FDA says that a breast and thigh temperature of 180 is acceptable for serving so that's my target. The same goes for the ribs. If you enjoy your ribs close to medium then check that the temperature gets to 160 and then pull them off the grill. This next step is extremely important. Place the Chicken and Beef Ribs in a large container with a lid. I like to use an aluminum pan then I spread aluminum foil over both and crimp it down. Keep the Chicken and Ribs sealed in the container for at least 15 minutes. This containment process will allow the meats to finish cooking and will restore the liquids in the meats so that they don't drain out on the first cut which can make the meat tough. In the following picture I've added asparagus that I cut the ends off and soaked in water for about 20 minutes. Then I coated the asparagus with a little vegetable oil and garlic salt. I placed the asparagus in a grated pan and placed that directly over the remaining heat source. I placed the lid on the grill to allow the chicken and beef ribs to complete their cooking cycle. After about 15-20 minutes I checked all the items. 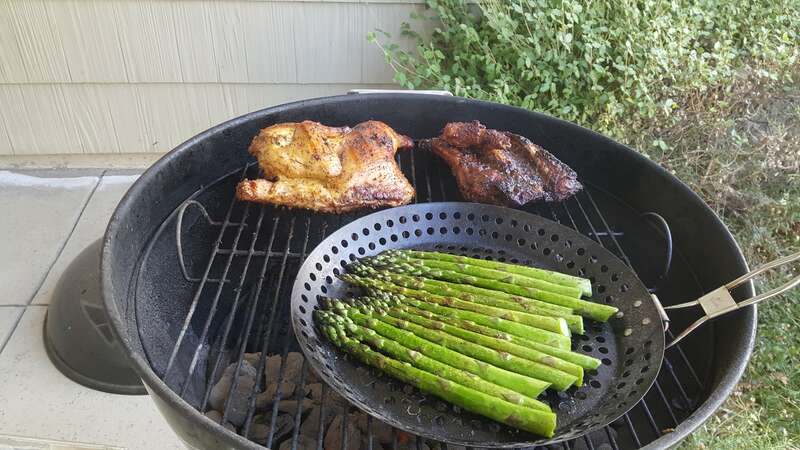 Once everything was done I put the Chicken, Beef Ribs and Asparagus in an aluminum pan then I covered them with foil. This is a wonderful meal and really sets the stage for a homemade Home-style barbecue. I hope you'll give this one a try. To get our dry rubs just go to our dry rub links and add to cart. The Asian marinade can be made with simple home ingredients. If you need more direction on how to make this barbecue just send an email to: [email protected] If you email we'll provide you with a free item on your next order. Serve and Enjoy our Homemade Chicken and Beef Ribs Recipe!